As part of our series in celebrating female NFL fans across the UK, I’d like to introduce you to Mia who is a San Francisco 49ers fan. Mia shares with us how she got in to the NFL, how she made the choice of her team as well as more about her overall experience as a fan. I got into American football back during the 2005 season, but it was actually college football that I started watching first. I had a friend who was a USC alum, and the first ever game I watched was the 2005 showdown between USC and mega-rival, Notre Dame. It was an epic one to get me hooked on the game, and I was fortunate enough to stumble into the Trojan family during the golden years of the Carroll era, with Matt Leinart in his last year at QB, sealing a nail-biting W against the Irish in the last few seconds of the game. I couldn’t get enough after that, and learned as much as I could from watching games and reading whatever I could find to explain the ins-and-outs, terminology etc. My college team was kind of picked for me (and even through the current turbulence and terrible coaching issues at USC, I’m still proud to be a Trojan), but after watching the 2006 Super Bowl, I decided I’d pick an NFL team to follow the next season. 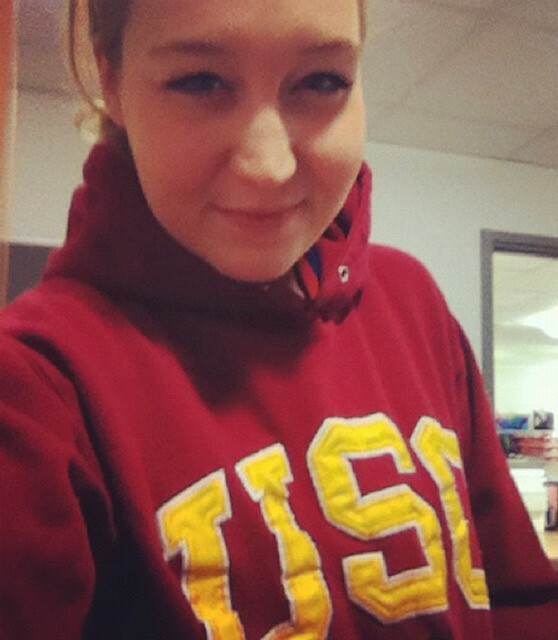 Honestly, one of the main things that drew me to the 49ers was the fact that their colours were so similar to USC colours! The Washington Redskins were the only team that had closer colours, but their name always made me a little uneasy, so I opted to go for San Francisco. The fact that the Niners were California-based on top of that, a state that is my second home (albeit SoCal, rather than NorCal), was another check in the Pro column. 2006 was my first season following the 49ers, which also happened to be the 60th anniversary of the team being founded. We didn’t end up with a winning season, but I’ve never been a bandwagon fan, so it didn’t bother me too much, as I settled in over the rough few seasons that followed (and there sure have been plenty of those!). By the time we managed to get some winning seasons, I was a firm fan, and the victories were definitely sweeter from having joined the 49er Faithful family during a playoff drought! As for live games, I have yet to make it to a 49er home game, but in the next few years I’m hoping that dream will become a reality. 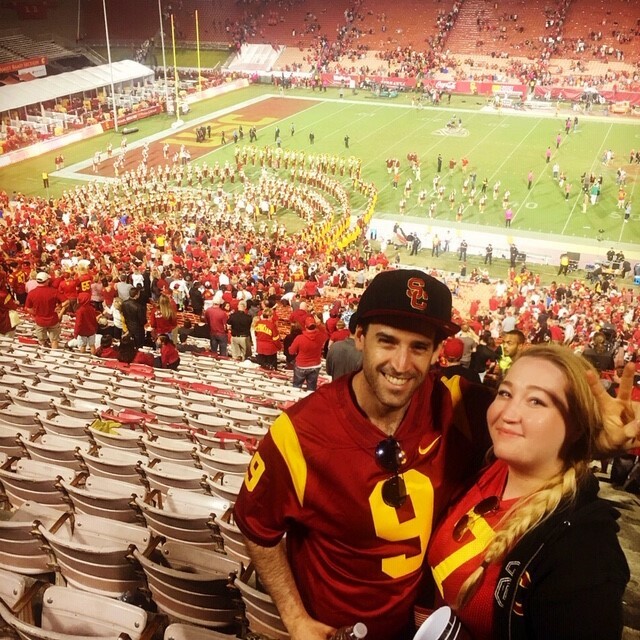 USC home games at the gorgeous LA Memorial Coliseum, and tailgating with friends (and Juju Smith-Schuster’s family, who still attend some USC home games!) have been a definite highlight of my time as a football fan. And despite having been a football fan for so long, the Jags-Eagles game at Wembley last year was actually my first International Series game! We had the best time, and there was such a fantastic atmosphere, even though we were pretty impartial as to who we were rooting for. It was great to meet so many other fans too, and to meet up with online football friends during the tailgate. I can’t wait to go again this year, and hopefully meet up with even more friends! Seeing as we spend so much time in LA, my boyfriend (whom I finally converted to the game a few years ago) chose his NFL team based on that. He didn’t have a choice when it came to a college team, and the poor thing is a somewhat-resigned/reluctant Trojan with a soft spot for the Georgia Bulldogs. But he had a pick of 30 NFL teams (I kindly asked him to refrain from choosing the Seahawks or Raiders, to spare me the pain of THAT division of our household! 😂)…and he chose the Rams. There’s plenty good-natured bantering, as you can imagine! My experience as a fan of this sport has been incredible, and even now I’m still learning! As well as the game itself, I love the community that NFL fans have created in the UK. There are a fair few Facebook football groups that I’ve become a part of, and last year I became a founding member of Hail Mary Hits, a charity that raises funds to help grassroots UK American football teams aka Britball. I discovered my local Britball team, the Merseyside Nighthawks, because of that group, and last year I began attending their home games. It definitely makes the off-season feel a lot shorter and a lot less painful, and fills that football void we all feel once the draft is over! Being a part of Hail Mary Hits, and attending events held by the ‘Gridiron & Gravy’ team in Manchester, as well as the events organised by the lovely Liz, has been fantastic, and really enriched my experience within the NFL and college football fandoms. I also love that no matter which team you support, everyone enjoys getting together for events, and there isn’t the same division between fans as there is with British football teams, for example. It’s a pleasure to be a part of it, and it’s great seeing the community grow each season. I love that the sport is becoming more popular over here now too, with more accessibility to games on TV and more international games each year as it becomes more mainstream. In the future, I’m very interested in potentially taking a coaching course, and looking at getting involved in some way with my local team(s) if possible. Getting to a home game at Levi Stadium is also at the top of my To Do list…hopefully it’ll be a Niners’ home game against the Rams!